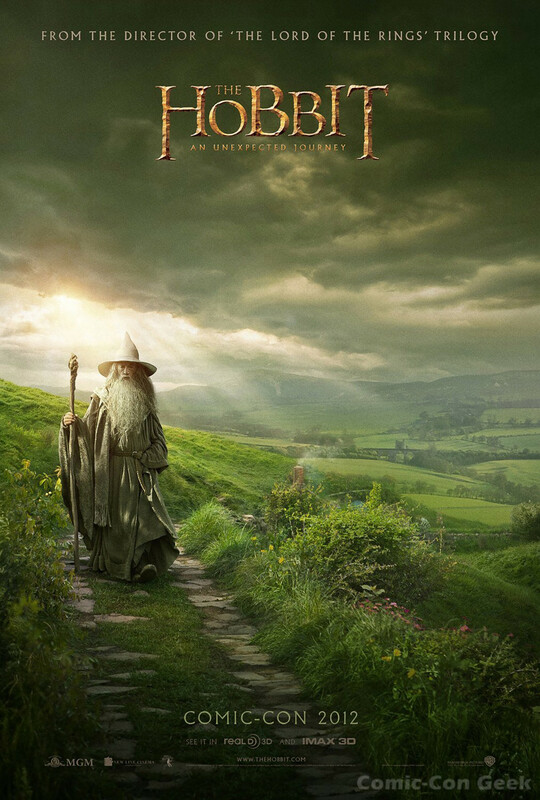 THE HOBBIT: AN UNEXPECTED JOURNEY Comic-Con Poster! 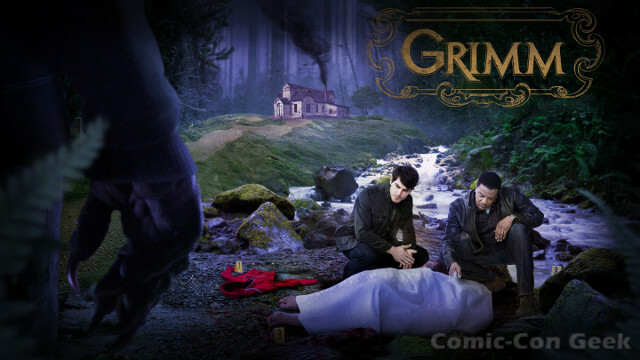 FIREFLY Will Be at Comic-Con 2012 with Joss Whedon, Tim Minear, Nathan Fillion, Adam Baldwin and MORE! It’s FINALLY OFFICIAL! 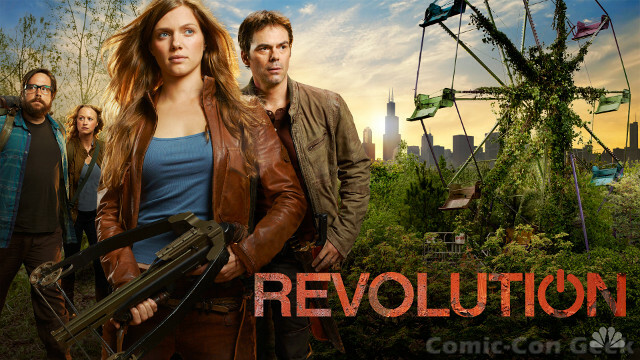 Firefly will be at Comic-Con 2012! This year marks the 10-year anniversary for Firefly and Joss Whedon and Tim Minear will be there as was mentioned on Twitter last week. 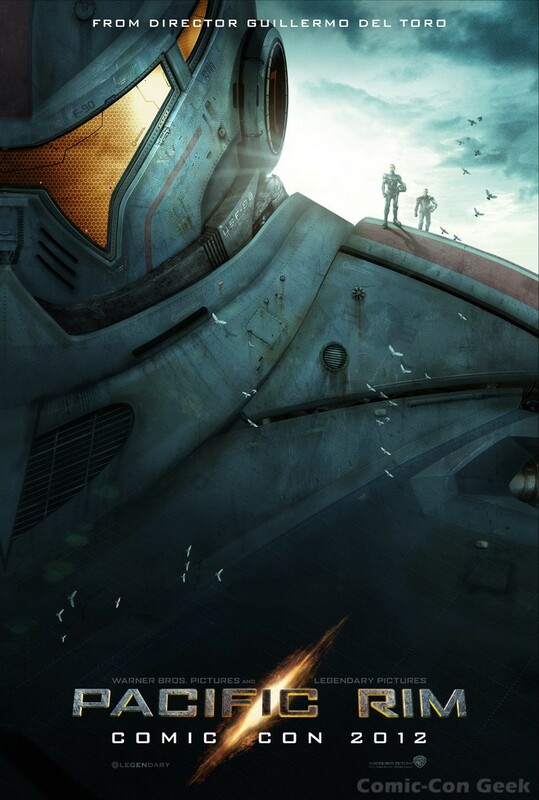 Nathan Fillion, Alan Tudyk, Adam Baldwin, Sean Maher, Michael Fairman and the rest of the crew of the Serenity will also be there for their panel on Friday, July 13 at 12:30pm in Ballroom 20! The panel is brought to fans by the Science Channel. Now you know who to thank! 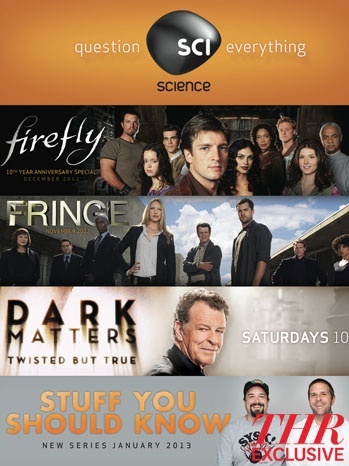 You will also thank them a FIREFLY Will Be at Comic-Con 2012 with Joss Whedon, Tim Minear, Nathan Fillion, Adam Baldwin and MORE!second time when you get a special collectible bag featuring Firefly and the rest of the Science Channel Comic-Con lineup! There will also be some never-before-seen footage with “numerous buzz-worthy surprises” according to the Science Channel. Anyone have any ideas what they may be? Leave a comment if you think what they could be. 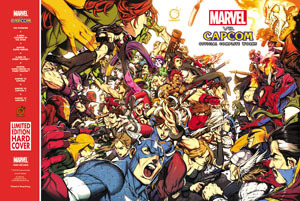 UDON Brings Marvel vs. Capcom: Official Complete Works Limited Edition Hard Cover to Comic-Con 2012! An amazing collection nearly 20 years in the making, UDON Entertainment proudly announces the impending release of Marvel vs. Capcom: Official Complete Works! 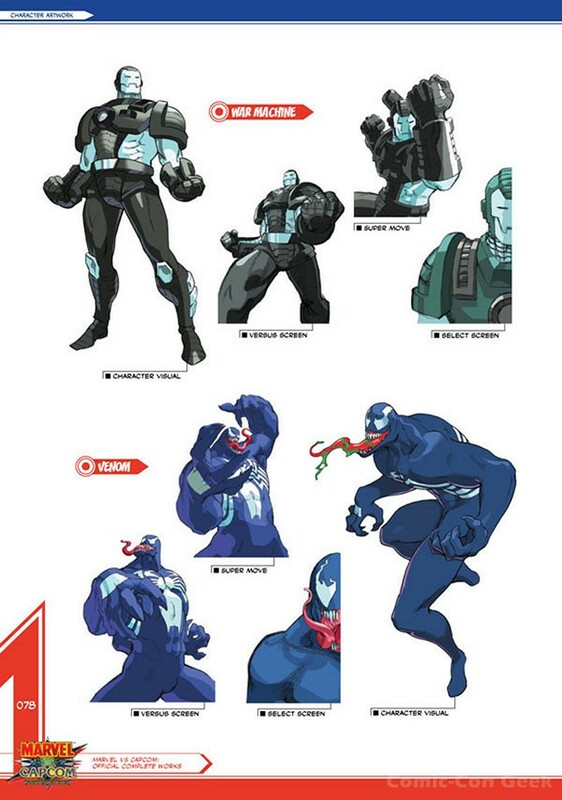 This is a brand-new art book collecting all of the official artwork, sketches, and bonus material from all of Marvel and Capcom’s video game collaborations—from 1993’s The Punisher arcade game right up to 2012’s smash-hit Ultimate Marvel vs. Capcom 3 for the PLAYSTATION 3, PSP, and X-BOX 360 platforms! 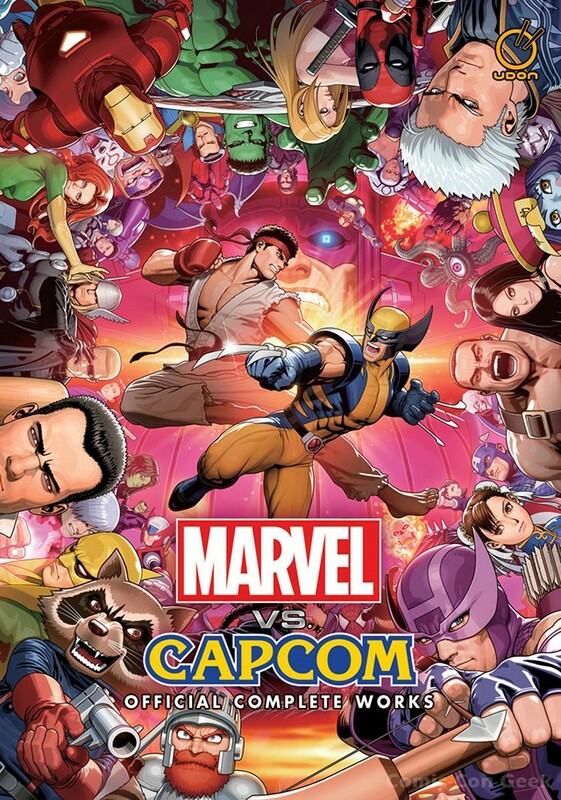 Compiled by UDON with the help of Capcom and Marvel, this is the first time this material has ever been collected in one place — on either side of the Pacific! 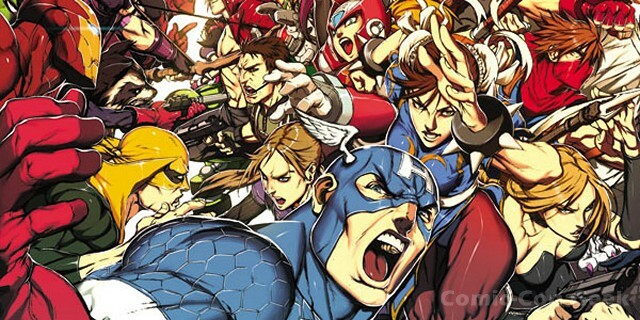 Weighing in at nearly 200 pages, Marvel vs. Capcom: Official Complete Works has been a labour of love for the UDON production team. 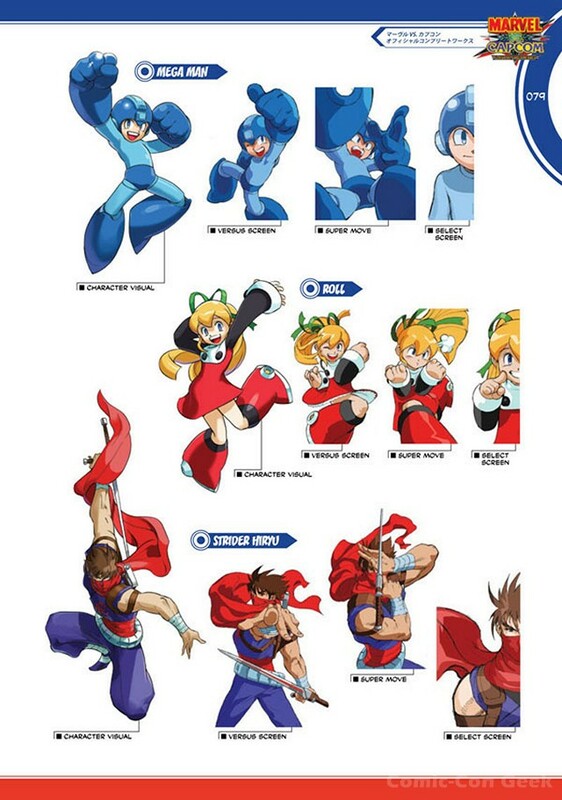 Working closely with Capcom creative head Shoei Okano, UDON has dug deep through CAPCOM’s archives to find extremely rare high-resolution art and materials to put together for this project — no easy task considering no Marvel vs. Capcom art book was ever printed in Japan! Includes stunning artworks by Akiman, Bengus, Shinkiro, Joe Madureira, Adi Granov, and more! Complementing the classic pieces are an all-new gallery of stunning Marvel vs. Capcom illustrations by comics superstars including Joe Ng, Long Vo, Chamba, Adam Warren, and Takeshi Miyazawa! 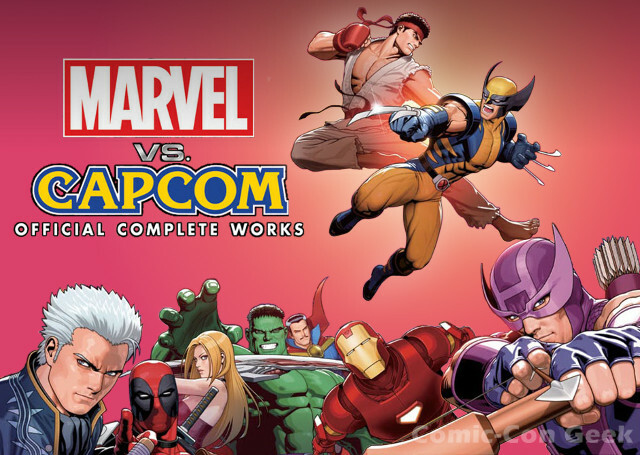 Marvel vs. Capcom: Official Complete Works will make its international debut at Comic-Con International: San Diego on Wednesday, July 11th, in an exclusive hardcover edition that will not be sold in stores. 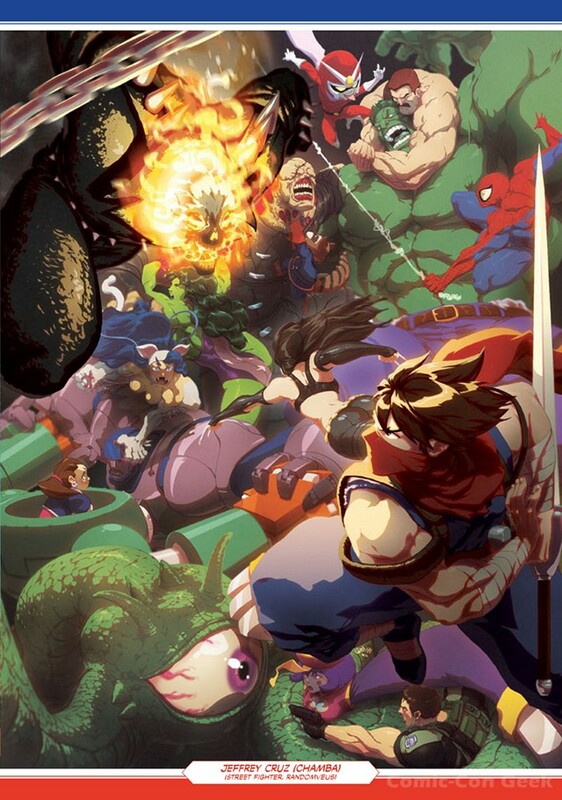 The hardcover will feature an exclusive wrap-around cover by UDON and Marvel vs. Capcom artist Alvin Lee and digitally painted by UDON`s Genzoman, and only 200 will be available over the course of the show. 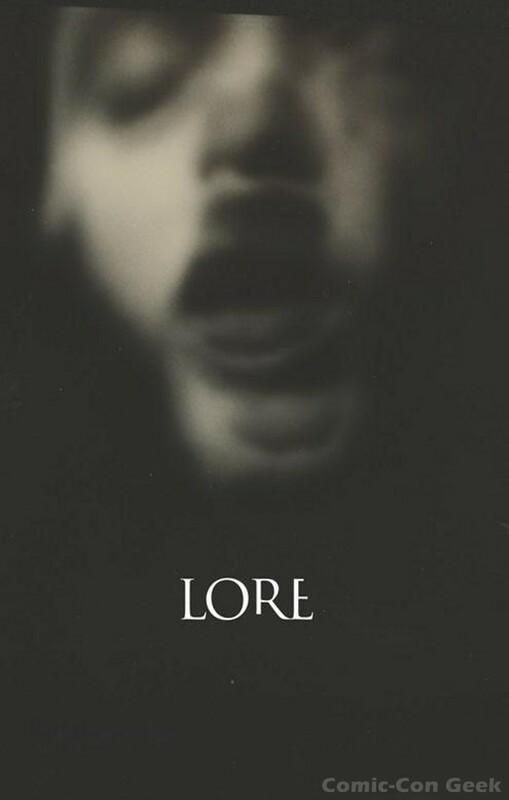 A standard-format soft cover release will follow in late November 2012, distributed by Diamond to comics and bookstores everywhere. This is an original art book compiled by UDON, with no Japanese counterpart! 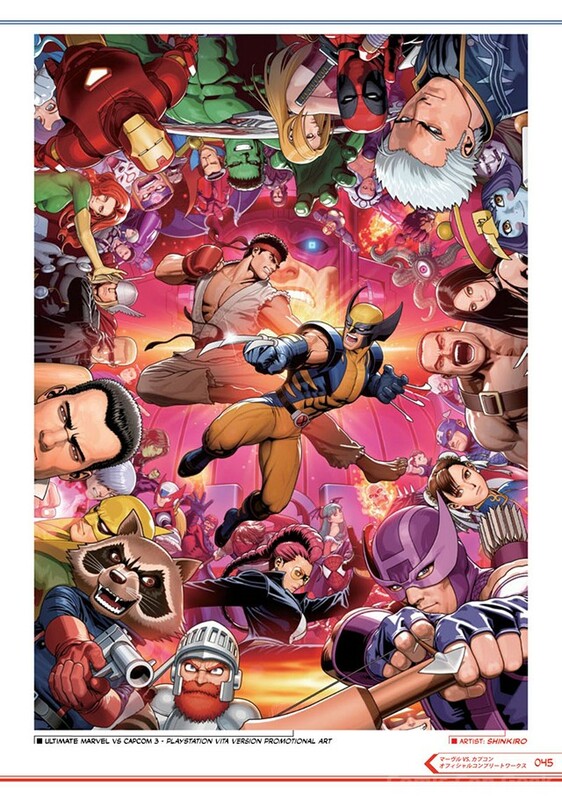 Includes all of the promotional artwork, a complete art archive of all Marvel vs. Capcom character drawings, and rare, never-before-seen artwork, sketches, and bonus material! Contains artwork from the Capcom games The Punisher, X-Men: Children of the Atom, Marvel Super Heroes, X-Men VS Street Fighter™, Marvel Super Heroes VS Street Fighter™, Marvel VS Capcom, Marvel VS Capcom 2, Marvel VS Capcom 3, and Ultimate Marvel VS Capcom 3! 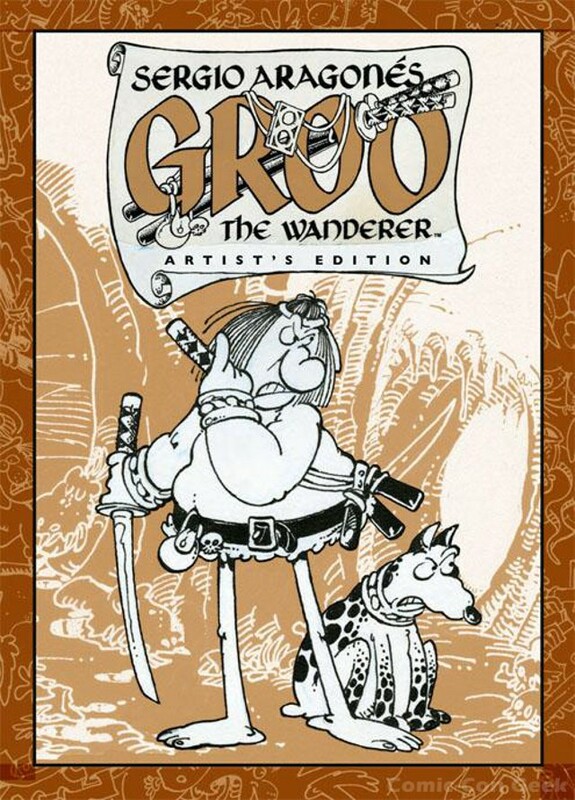 Includes 17 new illustrations exclusive to this book! This is the book that fighting game fans have dreamed of, since The Punisher and Nick Fury first picked up their guns, since Captain America raised his shield against Ryu`s hadoken! 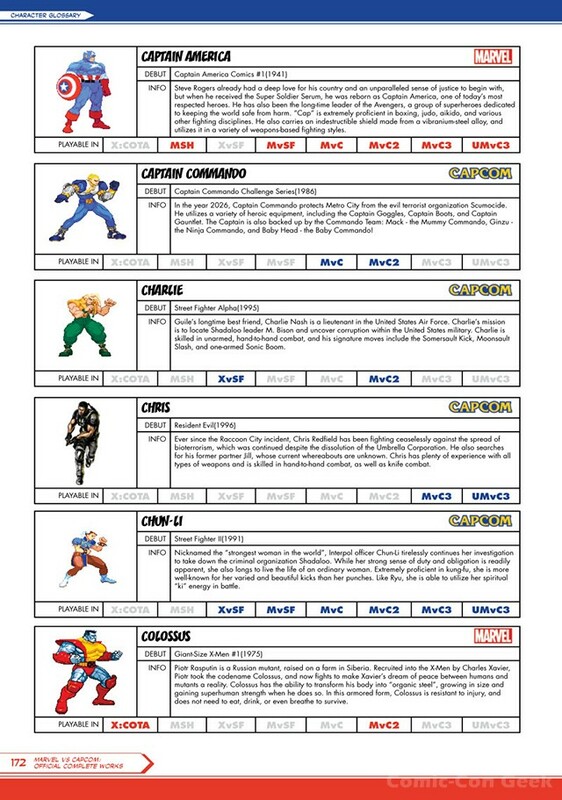 No fan of Marvel Comics, no fan of Capcom’s universe, no fan of videogames will want to be without Marvel vs. Capcom: Official Complete Works! Debuts July 11th, 2012. San Diego Comic-Con Exclusive. 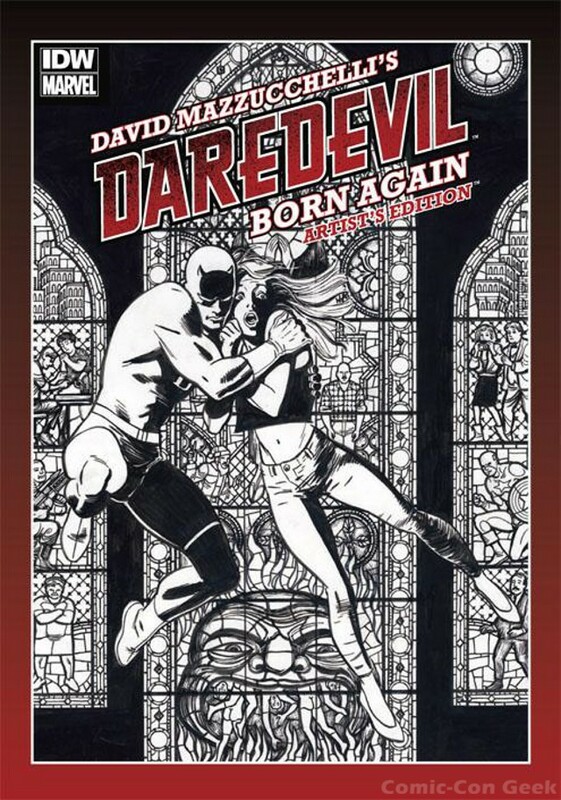 UDON Entertainment is a publisher of original comic books, graphic novels, and art books. UDON’s best-known projects are those based on popular video game franchises such as Street Fighter®, Okami®, Mega Man®, Darksiders®, Valkyria Chronicles and more. The publisher’s ever-growing library also includes English editions of several Japanese manga titles, the anthology art book series Apple, and the Manga for Kids line for children ages 7-12. For more information visit www.UDONentertainment.com. All characters and properties mentioned in this document are the property of their respective owners. Okami, Capcom, Devil May Cry, Mega Man and Resident Evil are either registered trademarks or trademarks of Capcom Co., Ltd., in the U.S. or other countries. Street Fighter is a registered trademark of Capcom U.S.A., Inc. All other marks are the property of their respective owners. 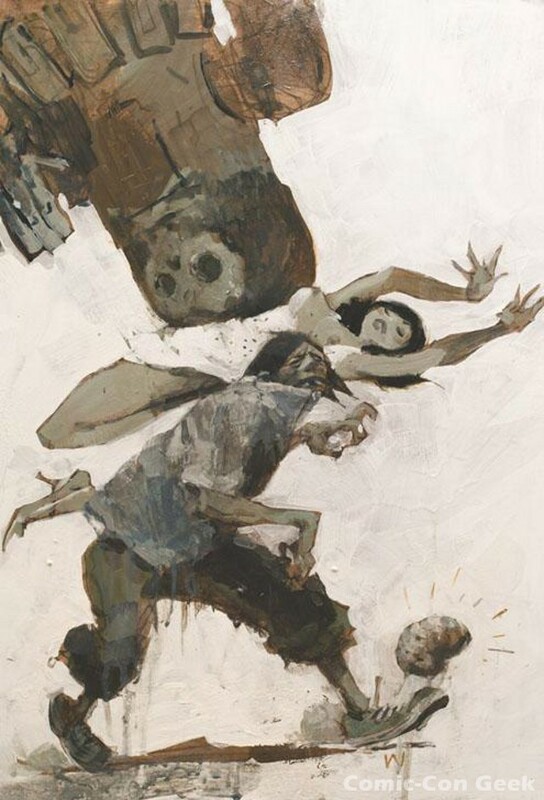 Co-Creator Simone Legno will be at Comic-Con this year! He will be signing at the tokidoki booth from 11:30am – 1:30pm daily. 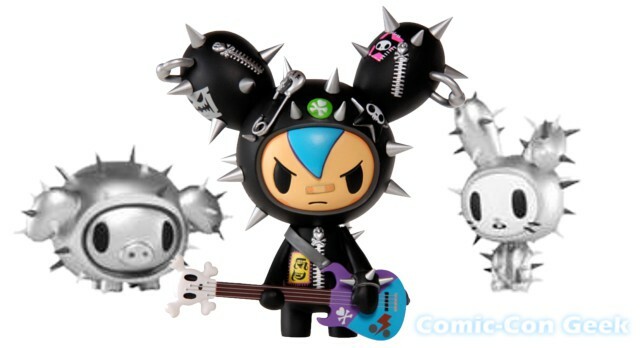 There will be lots of limited edition items available at the booth as well as their Comic-Con 2012 Exclusive, Cactus Rocker Blue! 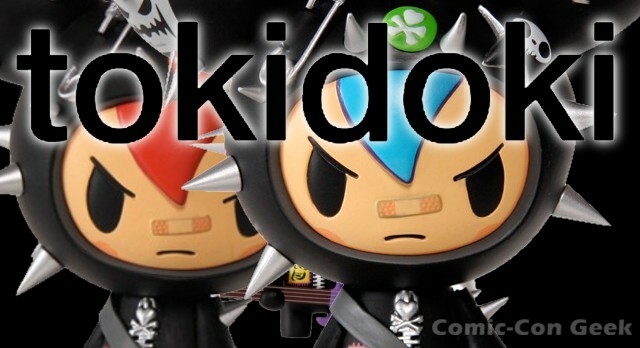 More info from tokidoki can be found below. 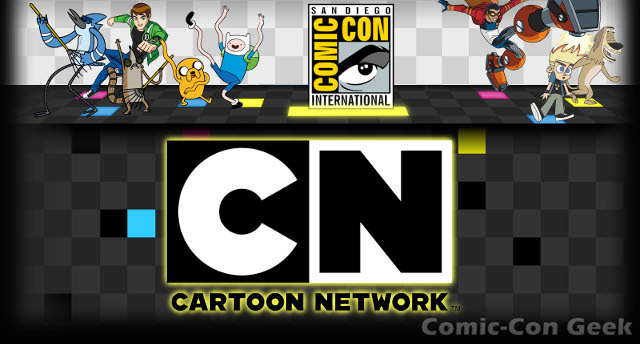 Cartoon Network Panels and Events at Comic-Con 2012! At this year’s San Diego Comic-Con, Cartoon Network’s amplified Convention Center presence will include a fan-centric booth, buzzing with activity showcasing a life-sized, interactive re-creation of the living room from their hit series Regular Show, where lead characters Mordecai and Rigby spend a majority of their time. As the network prepares for its 20th Birthday celebration later this year, fans will have an opportunity to be filmed by Cartoon Network cameras in the Regular Show living room or in the Network’s 20th Birthday “confessional room” sharing some of their favorite Cartoon Network memories. Some lucky fans may even be featured on the Network during three upcoming marathon weekends! For fans and collectors alike, this year’s Comic-Con exclusive giveaways will include five different Regular Show buttons and a sure-to-please Cartoon Network 20th Birthday mini-poster. With hit animated comedy series Regular Show and Adventure Time taking center stage at this year’s San Diego Comic-Con, events will include star-studded panels and signings along with other featured Cartoon Network series Ben 10: Omniverse, Annoying Orange, Dreamworks Dragons: Riders of Berk, Level Up,Star Wars: The Clone Wars, MAD and many more! Can’t make it the Con? No problem! “Cartoon Network’s Big Fan Weekend” will invite viewers from across the country to tune-in Saturday, July 14 and Sunday, July 15 for a first look at new series, sneak peeks of returning series and on-the-scene Comic-Con exclusives. 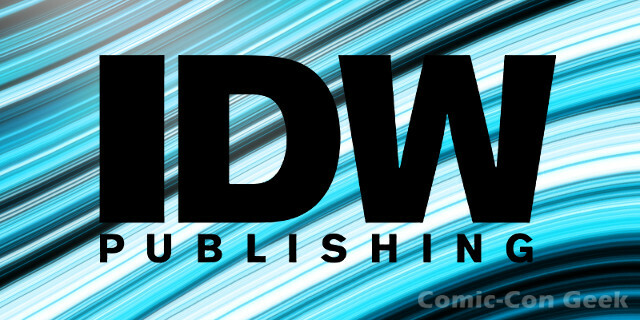 Below is a schedule of Cartoon Network series panels, fan events and signings at 2012 Comic-Con International in San Diego, Calif., Thursday, July 12 – Sunday, July 15, 2012. All times, dates and locations subject to change. Friday, July 13 – Sunday, July 15 at 2 p.m. If you are a big fan, Cartoon Network wants to meet you. Come tell us all those Cartoon Network memories in our 20th Birthday Booth (#3735). You may even be featured on TV during our BIG FAN WEEKEND. All ages welcome. Friday, July 13 – Sunday, July 15 at 4 p.m.
Do you look like a Racoon? A Blue Jay? No? Come to Cartoon Network’s Regular Show experience anyway, located at the Cartoon Network Booth (#3735) dressed as your favorite Regular Show character. Or just bring your Muscle Man Physique. Either way, we’ll possibly put you on TV. All ages welcome. Cartoon Network, currently seen in more than 99 million U.S. homes and 168 countries around the world, is Turner Broadcasting System, Inc.’s ad-supported cable service now available in HD offering the best in original, acquired and classic entertainment for youth and families. Nightly from 10 p.m. to 6 a.m. (ET, PT), Cartoon Network shares its channel space with Adult Swim, a late-night destination showcasing original and acquired animated and live-action series for young adults 18-34. 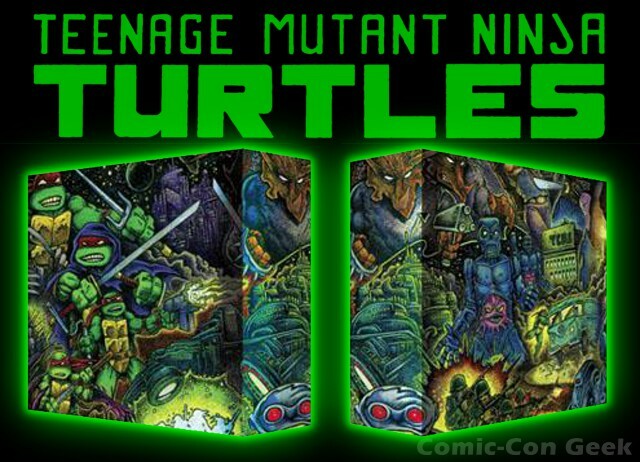 Film Cells Ltd. will be at Comic-Con 2012 with a couple of exclusives this year. The first one is The Dark Knight Rises Minicell. It is presented double-matted and framed with a cool image of Batman, an actual piece of film from the movie and a foil embossed certificate of authenticity. No price is listed, but this item should be around $30. This product is only available at Comic-Con 2012, please visit booth 418 at the show to buy this exclusive! Details of Comic-Con can be found on their website. Batman returns in The Dark Knight Rises, the final installment in Christopher Nolan’s trilogy, this time featuring the deadly Bane and the mysterious Catwoman. 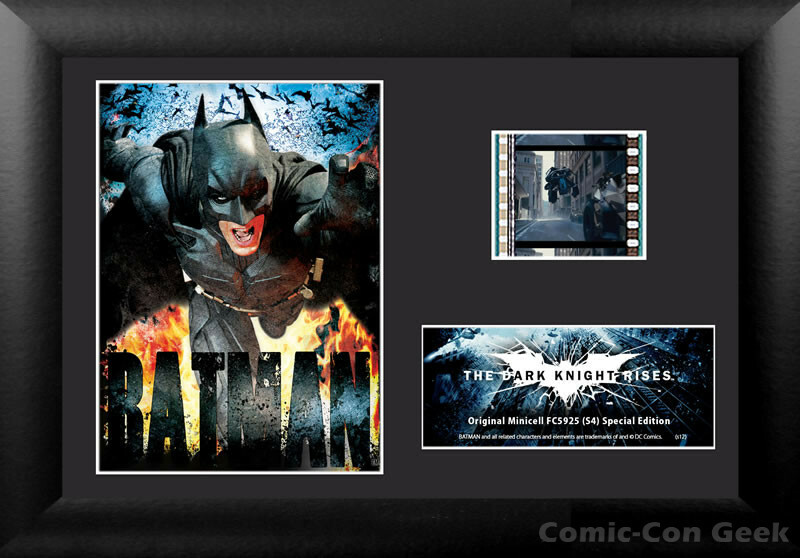 This special edition framed MiniCell presentation contains a striking image of Batman. Bring home a piece of the movie with this FilmCell collectible that boasts a real clip of film. 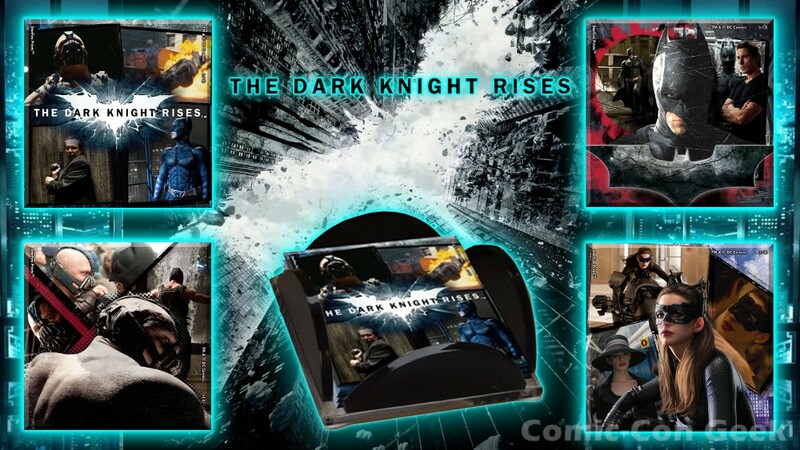 The second exclusive from Film Cells Ltd. is The Dark Knight Rises StarFire Prints Glass Coaster Set! These coasters look really good with great photos from the movie. No price has revealed for this item as well. Don’t forget to check out their booth (Booth #418) at Comic-Con 2012 as they’ll most likely have other items for sale as well! 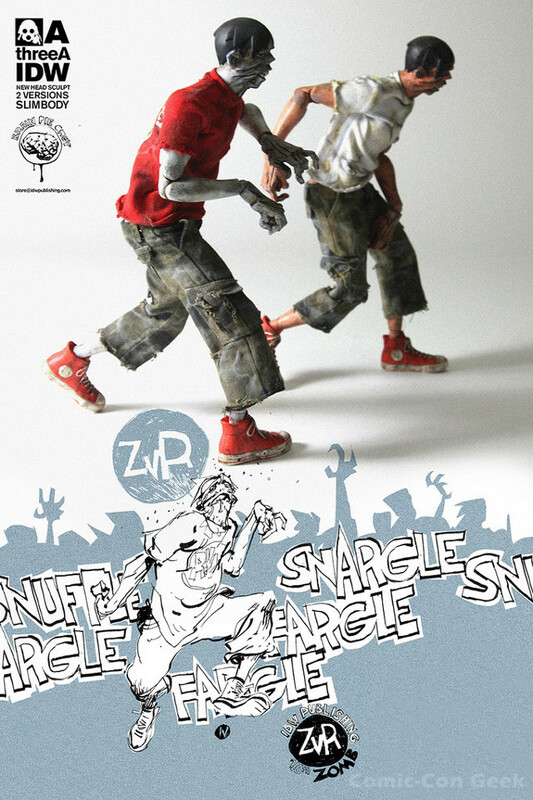 This product is only available at Comic-Con 2012, please visit booth 418 at the show to buy this exclusive! Batman returns in The Dark Knight Rises, the final installment in Christopher Nolan’s trilogy, this time featuring the deadly Bane and the mysterious Catwoman. Decorate your table with this memorable 4 piece coaster set that has custom artwork featuring the heroes and villains of Gotham City together with scenes from the movie. Each 4” coaster is translucent yet vibrant with color and made to ensure it withstands the test of time. 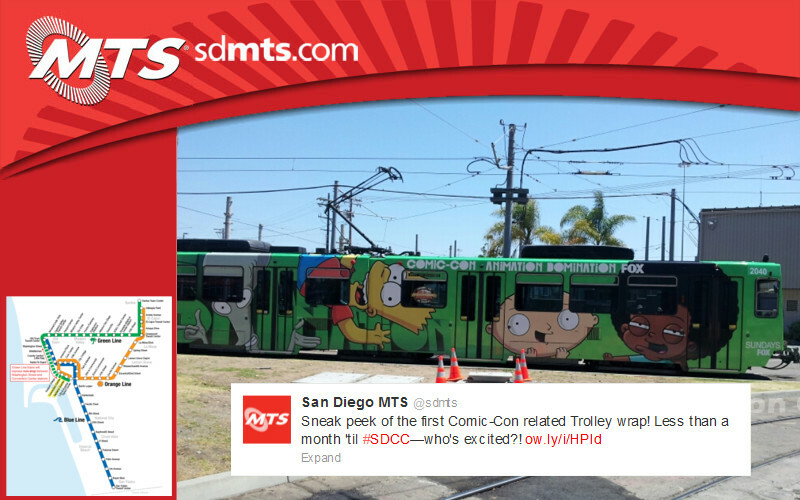 Even the San Diego Metropolitan Transit System is Getting into the Comic-Con Spirit!